TEWKSBURY, MA -- Both Rangers squads are returning back from the holiday intermission this upcoming week. Through the first 28 games, the EHL team sits in 2nd place in their division and 3rd place in their conference with a record of 17-8-3. The Rangers hold a 5-3-1 mark against divisional opponents so far this season, with ten of these matchups still remaining. The boys will get back to work this upcoming weekend in Walpole, MA for the final league-wide showcase of the season. 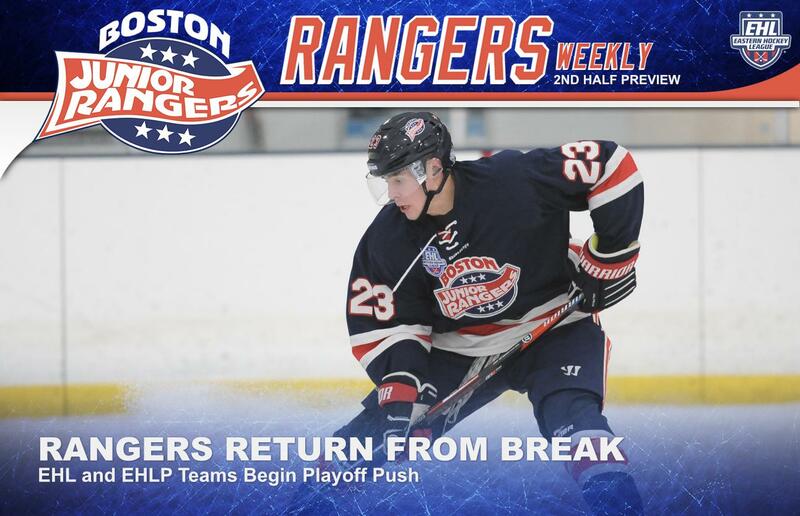 Looking past the showcase, the Rangers will play four straight games on the road before returning home for a matchup against the New England Wolves on January 29th. The EHL team will then have a very busy end to their regular season, with eight games in the month of February, along with two in March to finish out the campaign. The EHL team has found the back of the net 100 times this season, which equals out to a 3.45 goals per game average. On the flip side, the team has allowed only 65 goals on the year, averaging out to a 2.17 goals against per game mark. The squad is good for 21.2% on the power-play, and they’ve killed off 81.4% of the penalties called against them. Both Andrew Keith and John Grealish lead the team in scoring, as each player has tallied 21 points to date. Keith also leads the team in goals with 15. The Rangers leading scorer from last season, Zack Norby, leads the squad in game-winning goals with three and has been credited with 16 total points to his name. Erik Nilsson leads all defensemen on the team in scoring, with 14 points so far on the year. The Rangers have had solid goaltending play throughout the first half of the season, as Billy Girard and Aiden Curry have combined for 15 wins. Curry leads the team in wins with nine, and has a stellar 2.15 GAA. Girard has put together an impressive season so far as well, posting a 6-3-2 record to go along with a 2.20 GAA. The EHLP squad is tied for 1st place in their conference with a record of 23-3-2 through their first 28 games. The Rangers hold a 14-3-1 mark against opponents in their conference, with 14 of these matchups still remaining. In fact, 14 out of the remaining 16 games this season will come against conference opponents. The boys will get back to work this upcoming weekend with a pair of games, including a matchup against the New England Wolves on Saturday which will determine who moves into 1st place in the conference. The EHLP team will then take part in one more league-wide showcase, throughout the holiday weekend of January 19th, 20th, and 21st. The EHLP team has scored a total of 162 goals so far this season, and they’ve allowed 56 to get past them. The Rangers hold a 21.4% mark on the power-play, to go along with a 92% penalty kill rate, which is the best percentage in the league. Matt Orlando leads the team in scoring with 38 points in 27 games. Luke Marsh isn't far behind with 36 points of his own and is tied with Jake Mecrones for the most goals on the team with 19. Orlando, Marsh, Mecrones, Nick Weaver, Matt McPherson, Tanner Caldarola, and Levi Hensley all have an average points per game of at least 1.00 through the first half of the season. Josh Barton leads all defensemen in points with 20 and is second on the team in the assist category. Like the EHL squad, the Premier team also got strong play from their goaltenders in the first half. Bobby McCloskey leads the team in wins with 11 and he has a GAA of 2.17. Cam Libby has also been terrific in net with a perfect 9-0-0 record, to go along with a team leading 1.48 GAA.